I’m excited about the Capital Food Fight. For one thing it’s a chance to rub elbows with the likes of Carla Hall, Duff Goldman, and Tom Colicchio (oh wait… been there, done that*). It’s also a chance to enjoy food from DC’s hottest restaurants. But more importantly it’s a fundraiser for DC Central Kitchen. DC Central Kitchen is America’s leader in reducing hunger with recycled food, training unemployed adults for culinary careers, serving healthy school meals, and rebuilding urban food systems through social enterprise. This is one food fight I don’t want to miss. Hope you’ll join me! 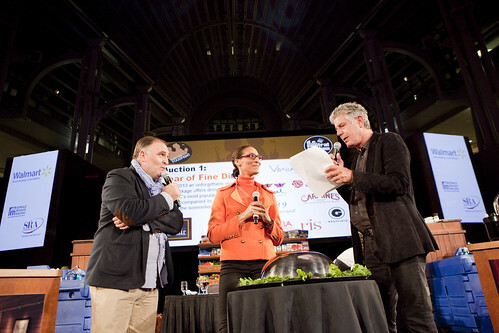 Join the iconic José Andrés and Carla Hall for the 10th Anniversary of DC Central Kitchen’s premier fundraising event, the Capital Food Fight. In celebration of the event’s anniversary, Duff Goldman (The Food Network’s Ace of Cakes) will host the event’s first-ever High Stakes Cakes competition featuring four top local cake decorators that will be judged by the audience. The event will also feature a live, on-stage battle with top local chefs to be judged by a panel of culinary celebrities, including James Beard Award-winners Tom Colicchio (Bravo’s Top Chef), Rick Bayless (PBS’ Mexico: One Plate at a Time), Todd English (PBS’ Food Trip with Todd English), and Art Smith (Cookbook author and owner of Art & Soul restaurant). Facing off this year are Erik Bruner-Yang (Toki Underground/Maketto), Bertrand Chemel (2941 Restaurant), Spike Gjerde (Woodberry Kitchen/Artifact Coffee), and Anthony Lombardo (1789 Restaurant). In addition to the live battle, attendees can sample tastes from 75 top local restaurants, including Barmini, Béarnaise, Blue Duck Tavern, Del Campo, Equinox, Good Stuff Eatery, Jaleo, Kaz Sushi Bistro, Le Diplomate, Oyamel, Ris, The Source, Toki Underground, Vermilion, and many more! Tickets: $250 available online at www.capitalfoodfight.org. All proceeds benefit DC Central Kitchen. For more than 20 years, DC Central Kitchen has pioneered a new model of using food as a tool to change lives. We provide nutritious meals to our neighbors in need, equip unemployed men and women to begin culinary careers, and engineer successful social enterprises that advance our mission while creating good jobs for the people we serve. Through job training, healthy food distribution, and local small business partnerships, DC Central Kitchen offers path-breaking solutions to poverty, hunger, and poor health.